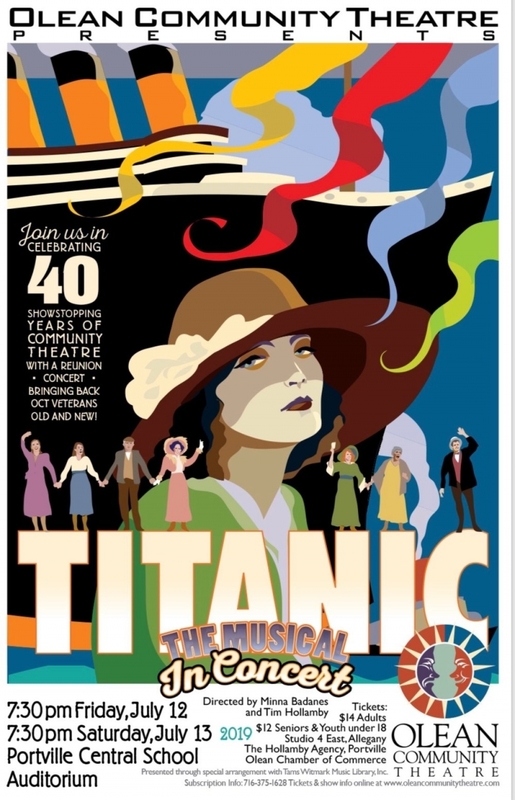 Olean Community Theatre presents "Titanic, the Musical". In a stunning chamber musical as massive as the ocean liner that shares its name, Yeston and Peter Stone’s musical, Titanic, tells the stories of the people on board the legendary steamer and the men who got them there. Spanning all classes, Titanic captures the stories from the whole range of humanity aboard the ship: from workers in the boiler room to first-class attendants, from the poorest passengers, who scraped together their life savings to purchase third-class tickets to America, to some of the wealthiest men of the Victorian age, including John Jacob Astor and Benjamin Guggenheim. Maury Yeston and Peter Stone’s musical tells the tragic story with a compassionate book, intelligent lyrics, and soaring melodies. Full of memorable characters based on the real men and women on the ship, Titanic is a powerful, complex look at the making of a tragedy. Performances will be held at the Portville Central School Auditorium. Tickets are $14 for adults, $12 for seniors and youth under 18.